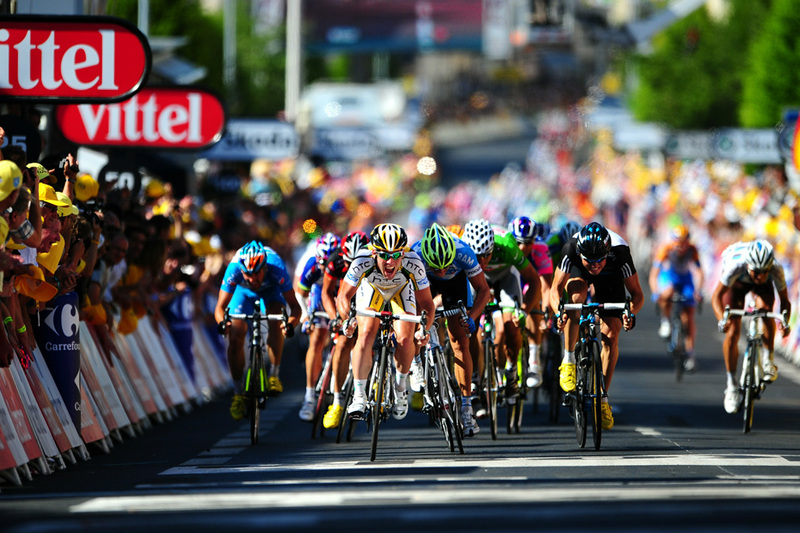 As July slowly draws to a close, we say farewell to the Tour de France. Groggy and hungover from Tour withdrawal, I wanted to share some of my thoughts on the past 3 weeks, 3,642 kilometres and 91 hours. Hopefully you’ll give me your thoughts as well! I don’t think anybody can argue that things didn’t really pan out in Lance’s favour this year. Things started optimistically with an amazing 4th in the opening time trial but seemed to quickly decline. After all the drama whipped up by the media, watching things play out was far from fulfilling. While, personally I don’t think Lance had the legs to win the Tour this year (evidenced by his inability to shake his break away groupo on Stage 16), I would have much preferred him loosing in a test of mettle, rather than succumbing to crashes and mechanicals. With Lance firmly stating unequivocally that this is his last Tour my main fear is not for the peloton, or for Lance, but for cycling in North America. I simply hope that our sport can continue it’s growth without it’s one universally known cyclist sitting in the limelight. Regardless of how you feel about Big Tex, you can’t argue what he’s done for both cycling (and cancer for that matter!). After the unfortunate crash of Christian Vande Velde and the eventual withdrawal of Tyler Farrar, Garmin Transitions were in a tough spot and a certain Canadian rider found himself with the unforeseen opportunity to do his team proud. What ensued was nothing short of remarkable. “Nadal syndrome,” is something Sheldon coined where we just can’t stand an athlete, despite them giving us next to no reason to dislike them. The ‘Manx Missile’ has filled this Tour role nicely… Cavendish is next to untouchable in a flat-out sprint yet despite being fantastically talented and charismatic, I can’t stand the guy. I had high hopes that Tyler Farrar would be able to take a stage or two, but after his wrist injury it simply wasn’t to be. Despite Cavendish’s speed and talent though, I’m glad that the Maillot Vert is about more than that. As far as I’m concerned Cavendish can have his stage wins, as he obviously deserves them. To me though, the the Green Jersey should go to somebody who’s more than just a sprint specialist. It has to be. A stage victory is enough for the sprinters. You need to be able to show me something for more than 15 seconds. Look at Thor Hushovd’s performance last year where he launched a brazen solo attack on a mountainous Stage 17 to claim both intermediary points and solidify green. Maybe I’m a Thor fanboy. Maybe I want the Green Jersey to be something it’s not. Alessandro Petacchi did the jersey proud this year, but I just hope that more men like him and Thor are able to keep it off the back of pure ‘stage sprinters’ like Cavendish in years to come. 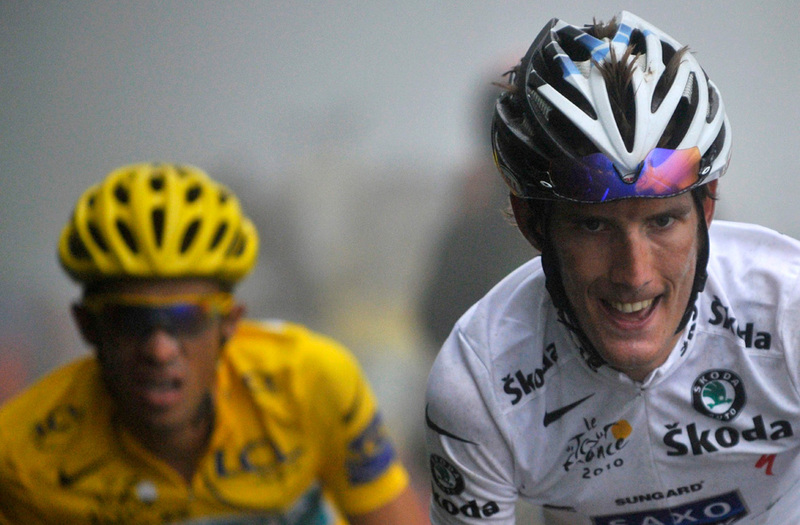 As the riders wound up the Port de Balès (the final climb on Stage 15), Andy Schleck made an initial attack and easily cleared his group, but as he prepared his attack is earnest he dropped his chain – whether part of a mechanical or rider error, I’m not sure. Contador was quick to counter and gapped the hapless Shleck. The media and the internet were almost instantly a-buzz. Should ‘gentlemanly’ rules have applied, as was the case in ’01 and ’02 when Jan Ulrich and Lance Armstrong both waited for each other (under admittedly different circumstances)? Or was the counter attack justified? Gerard Vroomen: Contador just gained a great chance to win, but he lost the chance to win greatly. Ryder Hejedal: If you draw your sword and you drop it, you die. If Schleck had been caught up in a crash of something out of his hands, I would be outraged, and write Contador off as a classless chump, but in this case Andy gave it a go, and it didn’t pan out. Contador attacked when he saw weakness… He didn’t wait to see what the problem was (though I suspect he knew it was mechanical in nature), he just dropped the hammer. I’m sure this is practically instinct for these guys – Despite being three weeks long, the Tour doesn’t provide an abundance of chances, you have to make the most of the ones that present themselves. Despite saying that it’s not what he would have done, Andy appears to quickly put the incident behind him. And if you want to hear Contadors thoughts/apology on the matter you can see it here. So with that, I open the floor to you – Agree with me, argue with me, or add a new thought to the mix… Let me know what you think! As an aside, I was able to enjoy all but the weekend stages of the Tour courtesy of Versus on the 2010 Versus Tour Tracker. I did receive some emails indicating frustration with the application, but for the most part the feedback (that I received) was overwhelmingly positive – I look forward to what they have in store next year! It was an extremely exciting Tour to watch this year. More so than recent years for sure. I actually agree with all of this! Contador is never going to be the “people’s champion”. With the attack on his own teammates last year and dropping the hammer on Schleck this year, it is obvious what AC’s intentions are. However, racing is racing and that is just how the cards fall sometimes. I do think that Schleck is going to up his TT ability over the next 11 months and Contador needs to be aware that future yellow jersey’s in Paris are just going to get harder as time passes. Great point regarding Andy’s TT ability… If the final time trial is any indication, the kid definitely has heart, and appears to have the base to start getting better! Next year should be stellar! I think Lance had the chops to win again, he just ran into a series of unfortunate events. Ryder is awesome. Can’t wait to see some more from him in the future. Cavendish is also awesome, and one day will win the green jersey. I’m not a Cav fanboy or a Thor one for that matter. I do like Thor’s on camera personality better. At the end of the day like you said the green jersey is about more than just winning stages, but it certainly doesn’t hurt and Cav is the best at that. I never heard that quote from Ryder about the chain thing. It echos my feelings exactly. It’s unfortunate for Andy but he definitely dropped the sword not the hammer on that one. Let me just start out by saying that I disagree with Ken on pretty much everything. Just kidding. Sadly, I didn’t get to delve into Le Tour as much as I planned on this year. Summers for me are the busiest time of year work-wise. I mostly just read the highlights in evenings, and caught sports news clips where I could. Still though, I could tell this Tour was one that will be talked about for years and years to come. On the positive, for me the Tour really became more about Ryder Hejedal, the lone Canadian near the top of the standings. Once I latched on to his story, I found hope and enjoyment in this Tour once again. What a ride! So, what will the Tour be like without Lance Armstrong? Well, in the rest of the world, I’m sure it will remain quite the same. But, here at home, where cycling news, and race coverage, even for the Tour, is still less than ideal, I am a little worried. I guess we’ll see. I never cared about Lance Armstrong. So many people were asking “can Lance do it again?” before the tour. I thought it was a dumb question. There was no way he was ever going to come even close to Contador. I was wondering if he even had a shot at the top 10 (obviously he didn’t). He needs to stop taking up so much of the spotlight, and let the cameras focus on the younger guys. I was cheering for Evans (who sadly was out quite early) and then Schleck after Evans broke his elbow. So i was kind of upset about the chain incident. But realistically, it wasn’t a big deal. He would have still lost the tour, and i’m not so sure it was wrong. Coming from a guy who has broken 2 chains in races, it was my fault every time. you can’t shift under power and expect it to end well. it’s a simple mistake. Maybe this is the mountain biker in my talking, but if i’m racing you and you drop a chain, behind me, and i’m not hanging around (then again i’m never racing in the front against the leader anyway). It was definitely entertaining. Ryder was my favorite story of the tour. It was made very entertaining that it came down to the final time trail. 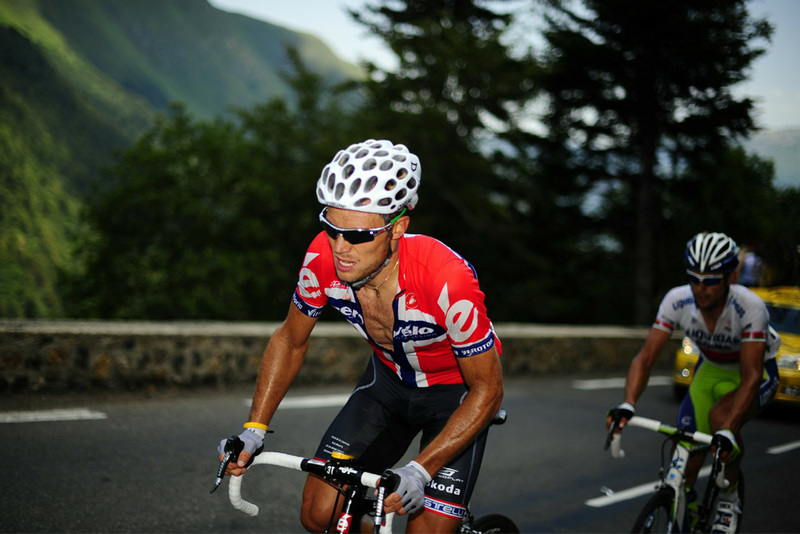 It was exciting, more so than if contador dropped andy in the mountains and was 5 minutes up. I think Andy is going to spend a lot of time in the wind tunnel. Maybe not enough by next year, but i think in 2 or 3 years, andy shleck will be unstoppable, until a new younger rider in the tour steps up. With that said, what I was *really* sad about was that Fränk wasn’t able to join his brother in the mountains… I think that would have made for some real high drama as Andy and Fränk traded attacks against Contador… I don’t know that he would have been able to stand up to both Schleck brothers. Great article Ken. Contador is a pill but he won. I think Lance was not a likely winner but he’s reached the legend level and doesn’t need to prove anything more. I’ll be watching Andy’s progress with interest. To mess this up even further, lets think about the rumors of a new luxembourg team, with frank and andy, it might not be as strong. I don’t know what’s happening with that, and we won’t for a while, but if Cancellara, and Voigt, and the two sorensons do not go, andy might find himself with a weaker team struggling with only frank to help in the mountains in the mountain next year. 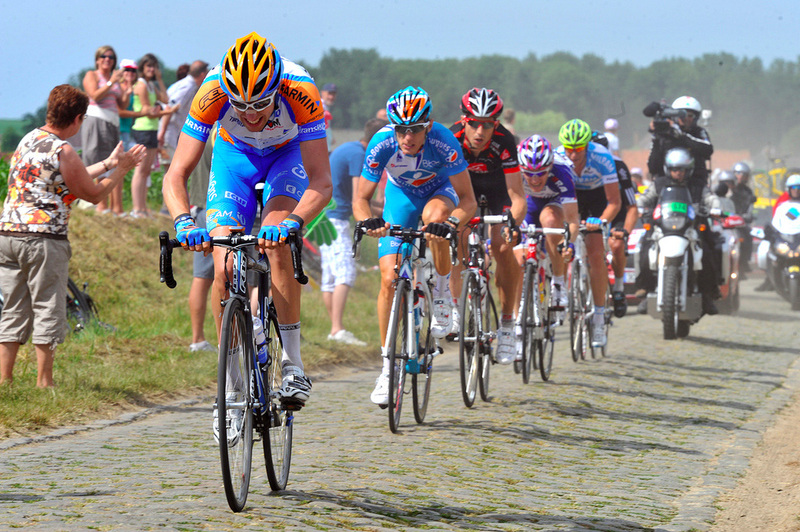 Andy is a great climber, but he also had probably the strongest team in the tour this year helping him. Next year might be a lot harder, if he is on a new team, which might not be as strong. @Dana – Well put, though with Andy’s clear intentions of being clad in Yellow, I’m sure any move would have to ensure that he’s bringing a few strongmen with him. People doubted Astana this year as well, but they were a force. Granted with the dissolution of Saxo Bank, Jens and Fabian are going to need a new home as well! Who loves to hate Cavendish? I’m baffled as to why he doesn’t sprint for the intermediary points (he’d be wearing green right now if he did), but otherwise I think he is the most entertaining rider in the sport – albeit for seconds at a time. Scratch that, he’s also hilarious off the bike. You might not agree with everything he says or does, but he is a genuine and humble athlete, without any pretense whatsoever, with immense ability, who puts every ounce of himself into what he does. Even with the odd misplaced gesture caught by the camera’s, I think he’s a credit to the sport. Just like Nadal… He’s a champion in every sense of the word, but for some reason I just can’t stand him. Second, I think that Carlos Sastre’s statement also sums up the #chaingate debacle nicely: “I think we’re turning cycling into a sport for spoilt brats,” said Carlos. Last, Thor’s hot. He should wear green more often..did you see the signed jersey in Speedtheory? As for Carlos’ comment, while I agree with it’s sentiment regarding #chaingate specifically, I have to say that I hope we’re able to hold on to some remnants of time past… Gentler days when honor was held above all else. I don’t think that #chaingate was a moment that warranted such gentile regard but I hope we are able to maintain certain ‘gentlemanly’ conducts. Yeah, it’s hard to explain why I don’t like Cavendish… I’ve seen him in interviews and he seems nice enough. Like Ken mentioned, I call it the Nadal Syndrome. Great, nice, humble, and still, I want to see you lose. Or, more accurately, I want to see others win more. In Nadal’s case, it’s Federer, and in Cavendish’s case it’s Thor. It’s called “Rooting for the Underdog”. It’s the same reason why Andy Schleck was so popular this year. People love the “looking for his first grand tour win” underdog. It has nothing to do with history or who’s better or worse it’s always “who’s second best?”, “who’s next?”. I heard an interview with Bernard Hinault where he comments on how the french public never like the winner cause “it’s easy for him” they cheer for second place “cause he’s a fighter”. @Thomas – Couldn’t agree more – With the exodus of Armstrong, it will be interesting to see how/if Versus capitalizes on this mentality… Rather than simply focussing on the top 10 riders (or in addition to that focus), they could focus on weaving more intricate stories around the underdogs and character riders (ie. Jens Voigt). I have never really liked Cavendish, because I do like the underdog and because he has a mouth and flips off reports. But I think with how emotional and humble he was at this year’s tour I gained a new perspective. The guy is 25 and has a lot of pressure on him. He doesn’t always deal with it in the most mature way possible, but I probably wouldn’t have at 25 (probably still would at 30). I think much like Cadel Evans (A rider I really am a fan of) he never wanted to be famous, and he’s kind of socially awkward and doesn’t like the spotlight, but was shoved in it anyway. He doesn’t always end up saying the best things, but it isn’t exactly his job to say the right things, it’s his job to win sprints. I don’t know if that was a coherent thought, but I think it’s so easy to think of professional athletes in any sport as “athletes” rather than just as people.